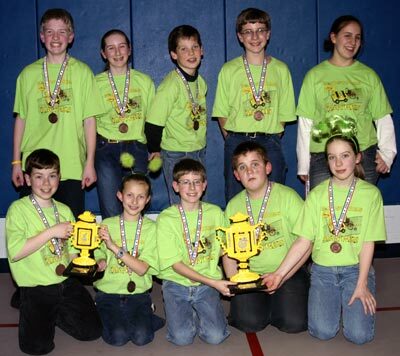 Over the summer of 2004, 5 of our 10 students graduated from FIRST Lego League to the new Mechanical Mayhem team for high school students. Since we had space for new team members, our FLL team got 5 new students! As soon as the "No Limits" challenge was announced we worked hard to create a reliable robot and a good presentation, finishing the night before the first tournament! At our first Local Tournament we were awarded 2nd place for the robot performance, and first place quality research presentation award. Later, we filled the eighth and final qualifying slot to the New Hampshire State Tournament!!! Two weeks later, we attended another local tournament and won awards for the 1st place robot performance and technical design. We were excited to be able to compete in the NH State Tournament. We were awarded the Director's Award and 1st place in the robot performance challenge! As a result, our team was invited to the FLL World Festival! The international FLL tournament was held in the Georgia Dome located in Atlanta, Georgia! There we competed with about 70 other teams from 20 countries. However, the favorite experience of most team members and mentors was playing chicken in the rooftop pool! Some other fond memories were going to the Hardrock Cafe, touring the CNN center, and holding "Mayhem Court" after a Southern clerk misunderstood something Vicki said. We had LOTS of fun before winning First Place Robot Performance and Second Place Director's Award!